To resume…..quite a break in the rebuild article caused by taking time to rebuild some engines…. & actually ride some motorcycles! So we have a set of cases together with a crank in place, oil pump back in the cases and we are ready to go with the gearbox installation…. Firstly, look back at the early paragraph about gaskets. The cassette outer cover must have a gasket fitted to it. It performs as a shim rather than a gasket. I fit the gasket to the case rather than the cover. Clamp it in place overnight with the bare cover & when it’s firmly fixed trim all excess off with a sharp craft knife. Note in the picture the cases have been machined away at the rear of the cluster aperture. This is to clear a special gear cluster which uses a rather large pinion which won’t fit through otherwise. Assembly of the bearings into the cassette cover is straightforward enough unless they have been spinning badly & then their alignment with the bearings already fixed to the drive side case might be compromised. Note: If the bearings in both sides ( crankcase & cassette cover) have been spinning badly, and are loose enough to drop out of the crankcase on disassembly, then fit both the cover & crankcase bearings at this point rather than prior to mating the cases to maximise the chances of their staying aligned. Use the mainshaft & layshaft (minus gears of course :o) as carriers for the new crankcase bearings. 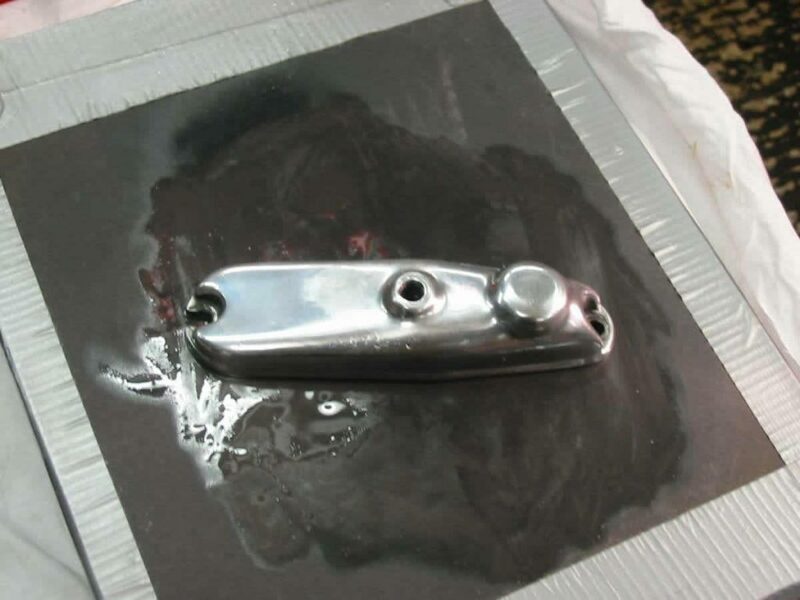 Introduce them into the crankcase recesses with a good coating of Loctite bearing fit. Do not heat the cases – no need if the bearings dropped out & also it speeds the hardening of the Loctite which we don’t want at this point. When both shafts are in place & the crankcase side bearings have settled home, drop the cassette side bearings onto their shafts again coated with Loctite. Now drop the cassette cover over them & screw down fully. 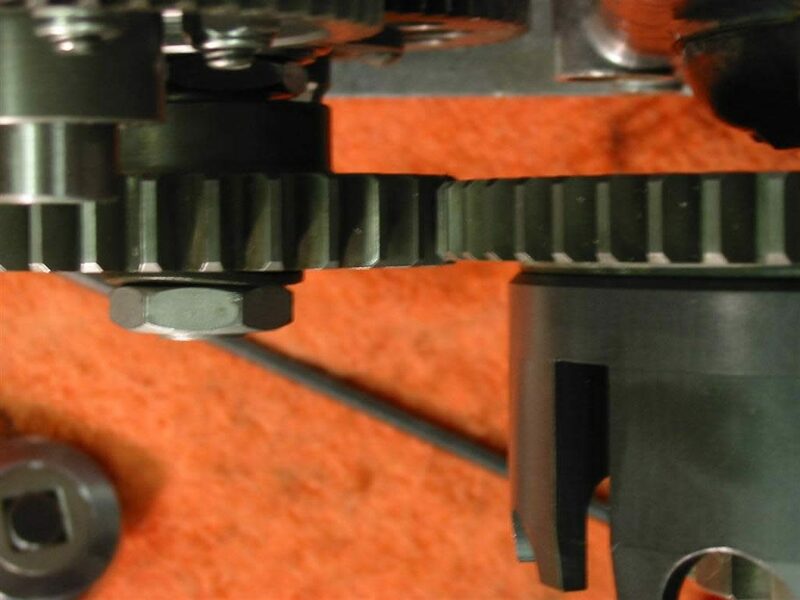 Leave the whole assembly to cure & remove the cover & shafts to assemble the gears. 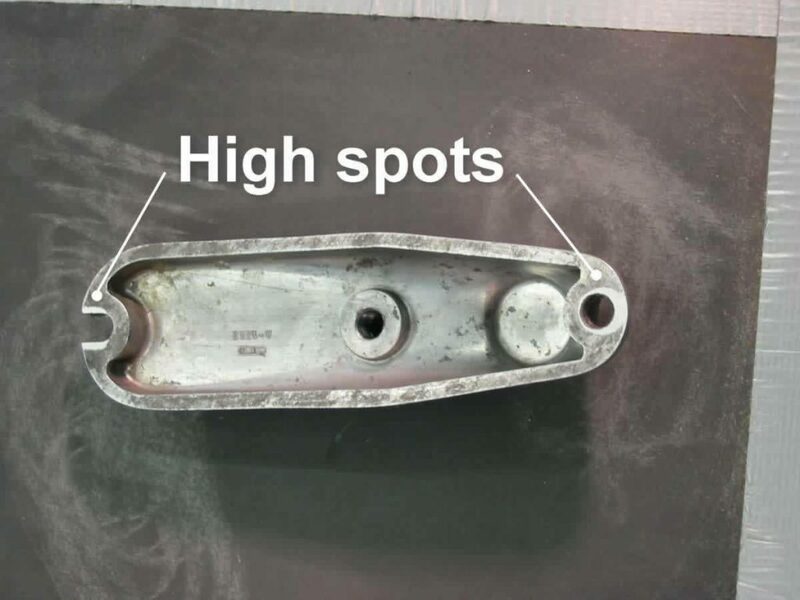 The bearings will be in line and Loctite will not release its grip on them easily if the correct grade has been chosen. I currently (2013) use Loctite 620 or 628 but ask the advice of your local stockist as there may be a better product available at the time you read this. Assembly of the gearset onto the cassette is very straightforward – no shims or other tomfoolery as with other lesser marques. I won’t tell you which gear goes where as if you didn’t note that on disassembly you shouldn’t really be doing the job! One thing to do as a precaution is to change the “O” ring on the gear change input shaft or “desmodromico” as I have heard it referred to rather more elegantly. If it starts leaking its the only oil seal in the engine which can’t be hoiked out without a great deal of disassembly. There appear to be two “slot” sizes on the shafts. OD of the slots remain at 18 but ID can be 13.25 or 14mm.The groove turned into the shaft varies from 2 to 3mm wide. The 2mm slot takes a 14 x 2mm (ID x sealing cord diameter) & a 13 x 2.5mm fits nicely into place in the 3mm slot. Both are standard sized metric “O” rings available at motor factors or bearing stockists. Once you have the shafts & gears on the cover (minus the clutch assembly) you can jiggle it all into place after oiling everything copiously. I use a bit of Wynns oil additive which seems to stay in place & provide some protection initially. The cassette cover is held in place by four 6mm x 1 Allen head screws & located by dowels. I use a drop of Loctite screw fix on them rather than risk them loosening in use. On this engine, I’m fitting a Nova / Emerson clutch which pops straight on in place of the standard unit. Tolerances are tight on these clutch replacements; in part this is to allow for the rather variable standards of Parilla’s own components. A tight fit can be rectified but if a critical component is slack on its shaft then little can be done. As mentioned on the Engine Parts page some fitting is likely to be required if upgrading to these components. Do not buy these conversions if you are not capable of making them fit correctly. 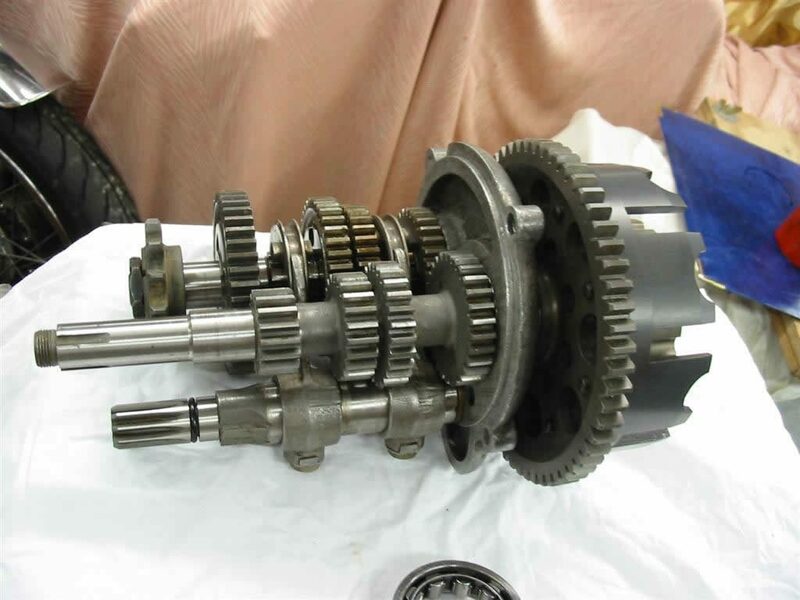 If you have carefully set up your crank in the cases & assembled the gearbox & clutch properly then the primary drive gears should end up in line whether you are using standard or replacement components. The next job on the engine in question was to fit a Gary Emerson gear drive cam conversion in place of the standard chain drive system. A very worthwhile conversion in conjunction with the clutch. Nothing much to be said about fitting the conversion here other than late 175 cases (with a boss for the chain tensioner fixing bolt) usually accept the gear spindles at the correct centres with no need for machining or welding up and re machining – 250 cases always seem to need the intermediate spindle relocating. 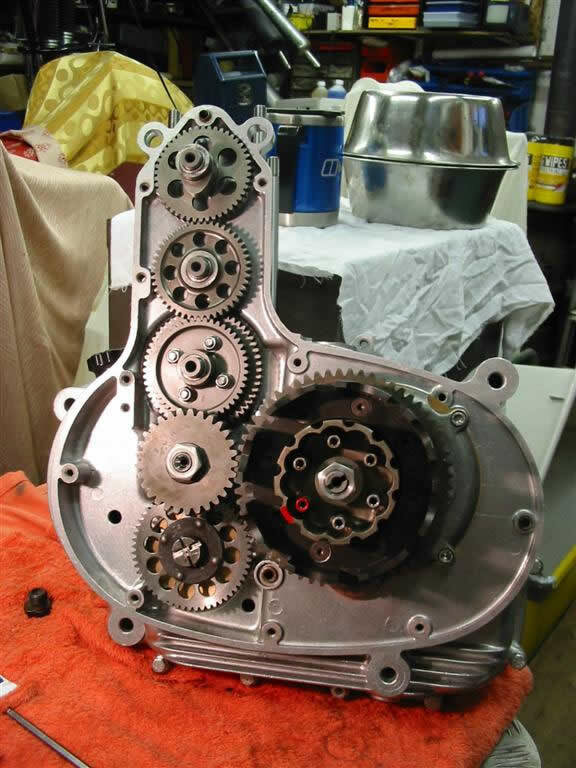 At this stage fix the timing tower spindles & ensure the gears & cam rotate smoothly and that the oil pump gear can be correctly timed even if you are using a CDI triggered from the generator side. Worth doing now if only to allow points to be used as a backup for the CDI unit should it go wrong at some time in the future – usually at the most inconvenient moment when a set of timed up points will be a godsend. Better to trial fit at this point than start locking up crank nuts & then finding the intermediate gear binds or the cam. When all is free to rotate lock up the gear & cam spindles with the OE washers & a drop of Loctite. Before moving on to more major components lets fix up a couple of more minor bits. 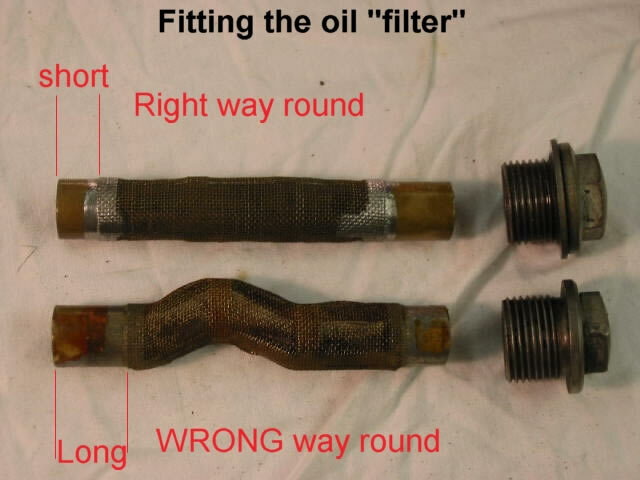 The oil “strainer” is often found bent & hard to extract. That’s because it’s been inserted the wrong way around. Oil still seeps through the mesh but having seen a few wrecked engines with the oil strainers fitted the wrong way round it does make me wonder if at high revs it doesn’t restrict the flow enough to cause oil starvation? Or it could be that a mechanic who doesn’t realise there is a right & wrong way round may not be so hot on other aspects of Moto Parilla engines? No excuses accepted from this day on for inverted oil strainer tubes. To clarify – “long” refers to the length of brass tube exposed when fitting the outer screw cap. If you do need to fabricate a replacement filter this diagram will allow you to do so. Don’t be tempted to go for a finer mesh screen to improve “filtration”. All you will achieve is lack of flow at the time the engine requires maximum lubrication – when cold with thick oil reluctant to flow. Far better to ensure the oil is changed frequently. 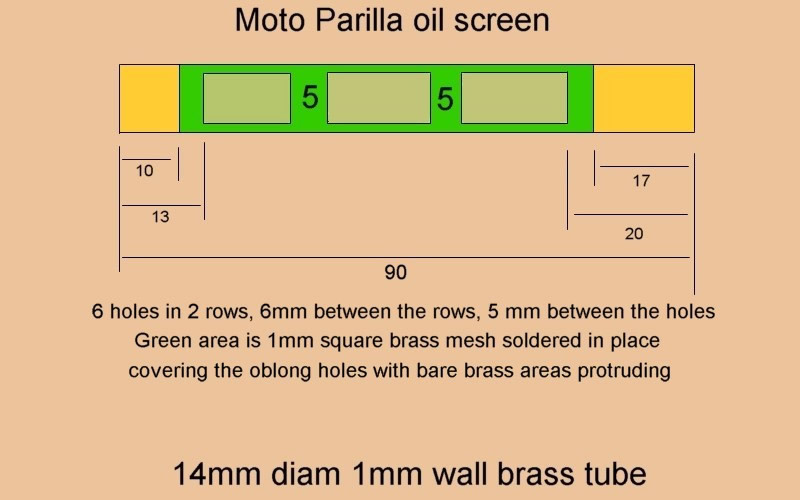 Something to look out for on Moto Parilla 175 & 250 cylinder heads is porosity in the casting. I have found the area where the rocker spindle screws into a protruding boss to be prone to leaking from the bottom of this casting. The picture shows my “fix” which also illustrates the position of the porous area. The head has been thoroughly cleaned & degreased. I introduce a quantity of clear silicone seal into the boss, ensuring no air is trapped beneath, and then screw in the rocker shaft until it bottoms. Leave it to set completely. 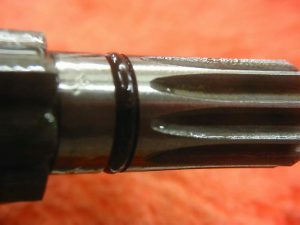 A light smear of grease on the screw thread & its tip ensures the spindle can be removed without disturbing the sealing plug. I bought, at considerable expense, 200 rocker box gaskets from the OE manufacturer of Moto Parilla gaskets. These I can supply in pairs as an alternative to buying a complete engine set. Having supplied such gaskets to one gentleman I was surprised to get an email of complaint. 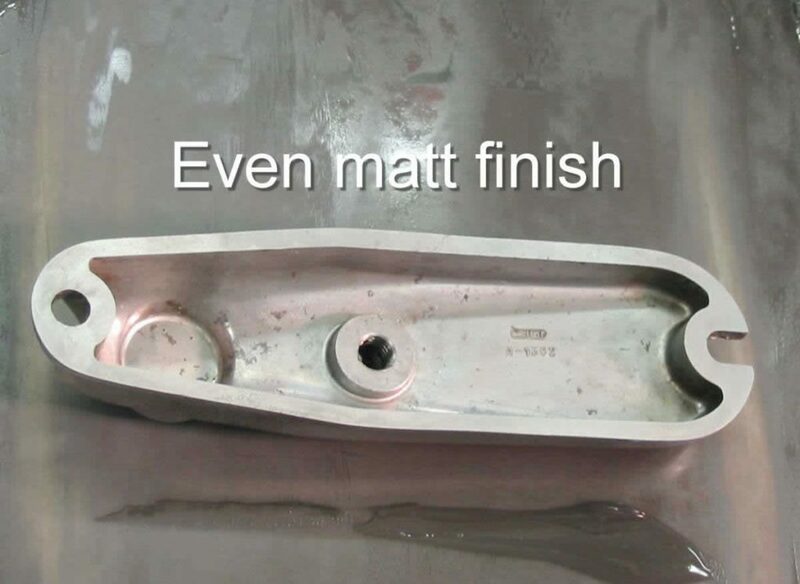 Unfortunately, until the “smart gasket” is invented which can accommodate bowed & uneven mating faces we will have to continue to ensure the faces we want to joint are flat & can be drawn up parallel with the gasket between them. You need a surface plate, a sheet of #800 grit 3M abrasive paper, some light oil, a deal of patience & when fitting the covers to the head a degree of mechanical sympathy. Firstly attach the paper to the surface plate then perform a couple of “figure of eight” circuits using very light pressure. High spots will be revealed caused by the cover being deformed by overtightening of the fixing screws. Work the cover until an even matt finish is achieved using a few drops of oil on the paper. It is now flat and with a fresh gasket & an appropriate amount of leverage applied to the fixing screws it will not leak. Parilla 250 rocker armsEarly hicam engines had spindly rocker arms with adjusters over the pushrods (as all did ) and curved ends which contacted the valve tips. Later versions had a removable pad at the valve end. 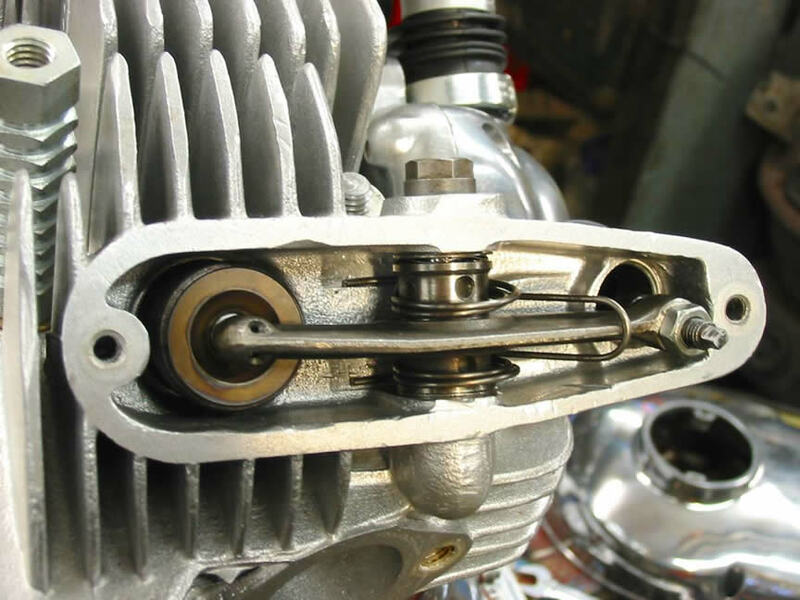 The 250 engines had “beefed up” rocker arms with captive ball bearings in the valve end. 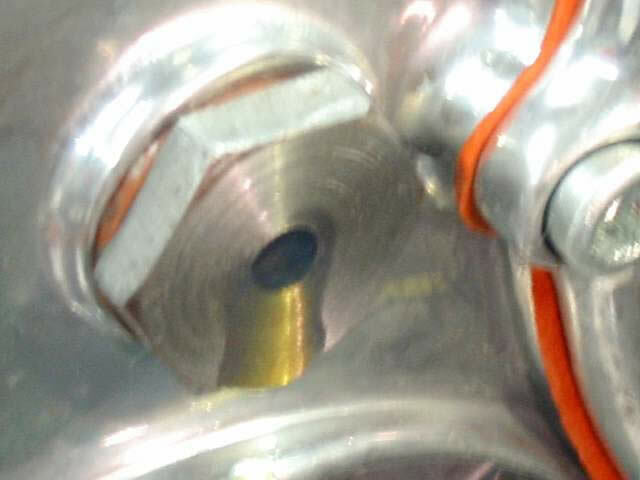 These balls had a flat ground onto the valve contact surface. 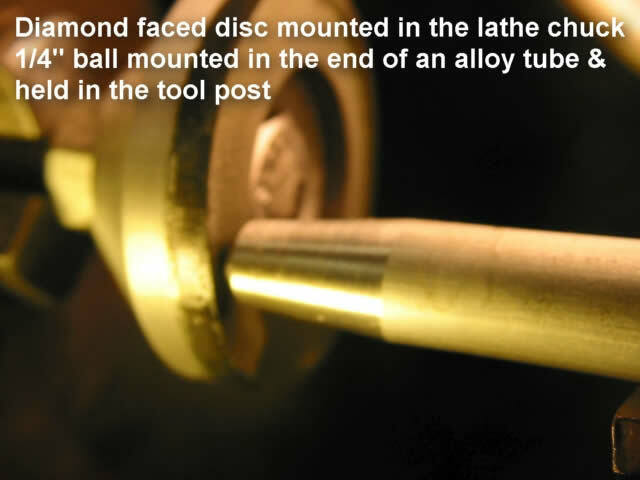 They were retained by the rocker arm material around the ball being peened by a tubular punch which formed a slight rim around the circumference of the ball seating socket. So far so good….. 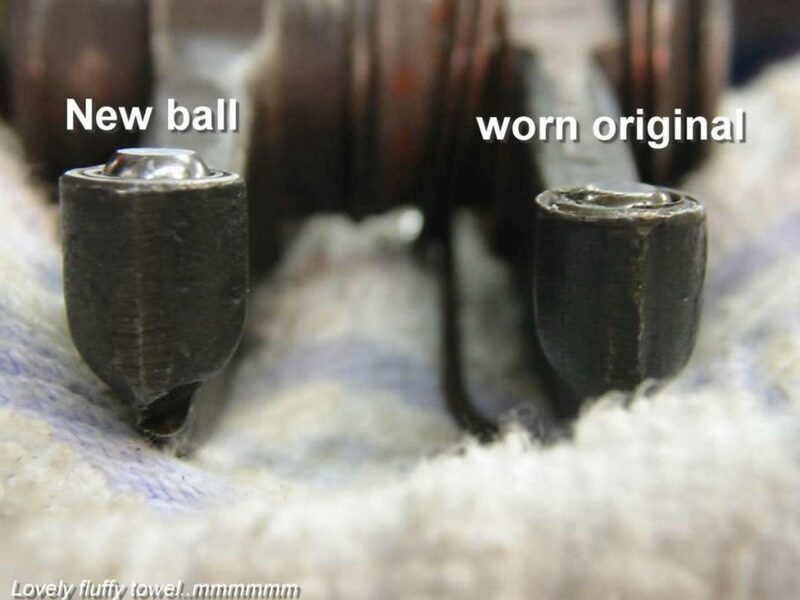 The ball is free to rotate in its socket so some lubrication was provided. 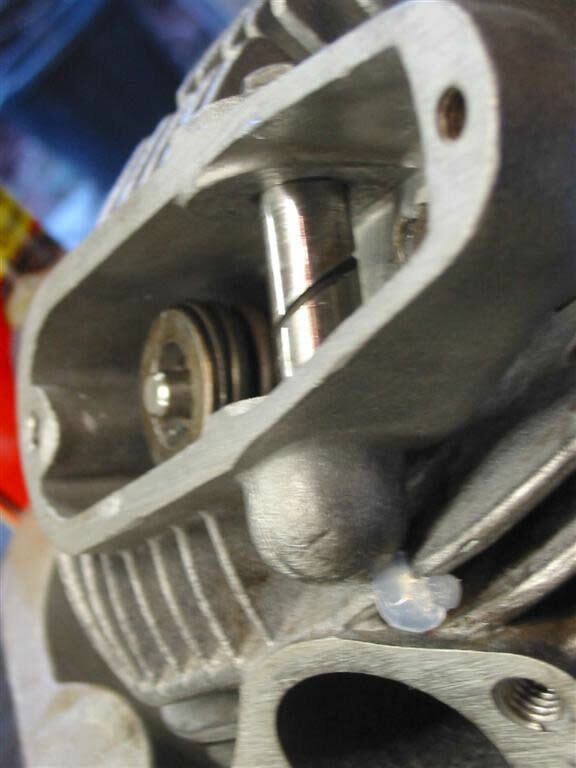 Initially by a single hole in the top of the rocker arm directly above the ball. Quite how much oil was supposed to know how to get into this hole is unknown. What is known now is that the oil that did know its way into the hole wasn’t told to go any further….. This led to an interesting wear pattern on the captive balls. 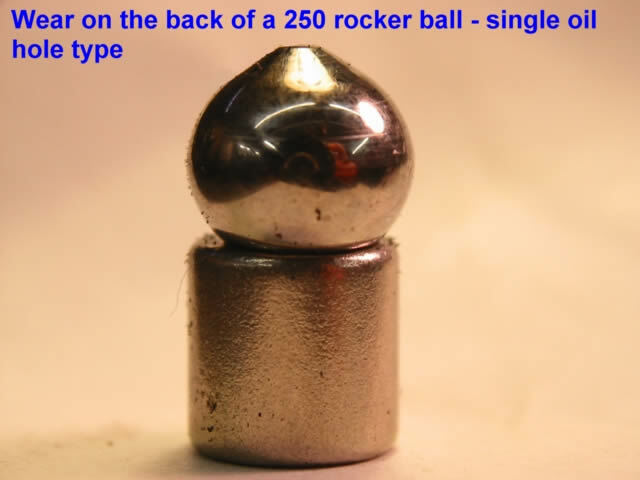 In the picture on the left you can see a worn “single oil hole” ball sitting on a small magnet. The ball now has a “tip” with an unworn point where the oil managed to find its way through the hole. The shoulders of the ball remained unlubricated & wore away to the shape shown. Not ideal. The worn ball sinks into the socket & on disassembly of the rocker from the head usually drops out unseen…if you are lucky into your parts tray. Moto Parilla addressed the problem on later engines by drilling twin holes in the rocker arm tips & forming little wells around them. Some of my engines have the twin set up others the single hole. Both types can benefit from new ball ends to restore rocker geometry & get the rocker adjusters back to a mid-position setting. Note also in the picture the rocker spring. I put them on that way round to keep the cam follower train protected from any shock loading caused by uptake of the rocker clearance on valve opening. Moto Parilla left them off race engines & I’ve seen them fitted the other way round too. The answer is to get yourself a cheap diamond faced grinding disc, mount it on an arbour and grind away at a new ball bearing. Ball bearings are hard all the way though so no problems. 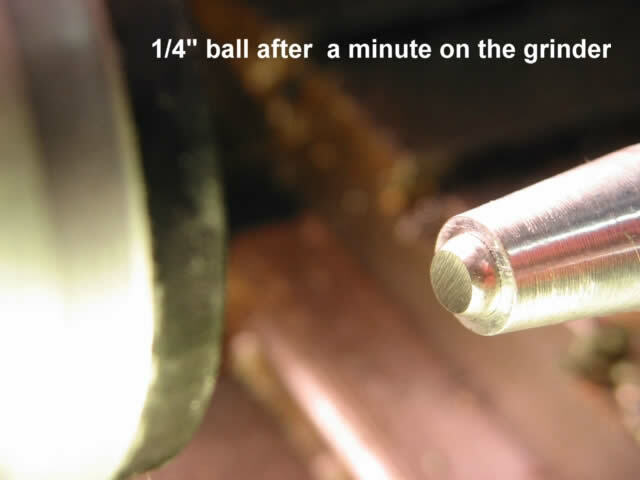 The 1/4″ ball is lightly tapped into an alloy rod with a slightly undersize hole in the end. Square it all up & with a splash of cutting medium grind away until a similar sized flat is produced to the original ball. Once the new balls are made you can usually tap out the old ones through the oil feed holes in the rockers. Easier with the single than twin hole versions. The new balls can be “peened in” either with a custom made annular punch (silver steel bar machined to size, hardened & slightly annealed) or Neanderthals may prefer to use a wad punch of suitable dimension. All the manuals tell you to oil bits & pieces as you assemble them & usually the throwaway line ” prime the crankshaft with oil before starting the engine” appears somewhere. Easier said than done with the Moto Parilla. But an oil injection point can be easily made from an old timing cover crank plug. 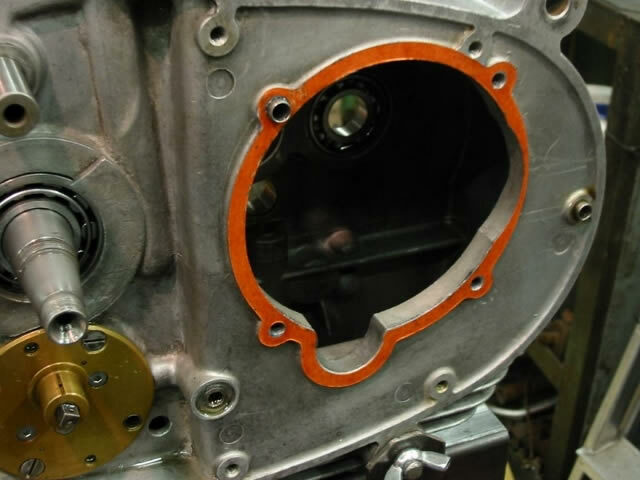 You could tap it to take a pressure gauge & see the mighty output of your refurb’d oil pump…. but that might frighten you. So you have torqued up the head nuts & want to remove the exhaust rocker spindle for some reason or more likely left assembly of the rockers until after you have torqued up the head nuts & found you can’t get the exhaust rocker spindle in place as there is a sleeve nut in the way. So just undo the offending sleeve nut? Given the Parilla head is a delicate casting which we know is prone to distortion it seems unwise to me to undo fully just one of the cylinder head fixings. 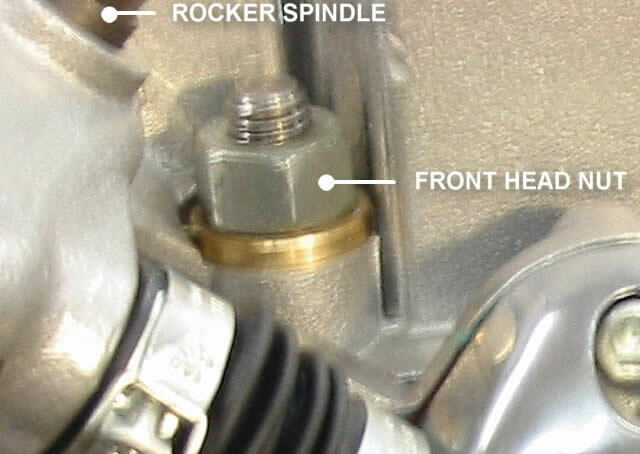 If the head doesn’t distort the gasket sealing might be affected & the exhaust tie bolt tension will be too. Either undo all fixings (including the two tie bolts) or make up a two piece sleeve nut for the front stud on the timing side. 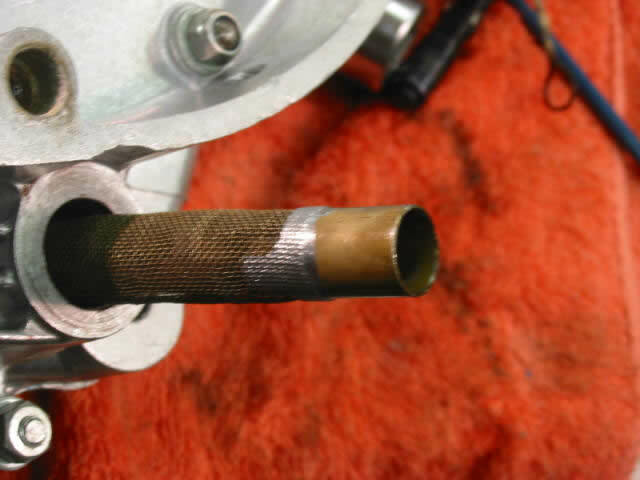 If you do that then the cylinder stud will remain tight & you can remove & replace the exhaust rocker spindle. The long sleeve nuts connect to the head steady and I feel that the 2 piece version can function adequately. It is not an engine “mounting”. I have a selection of sleeve nuts of different lengths from early & late hicams. In the pictures, you can see I used a very short version along with a standard head nut. On other engines (I do this mod to them all) I cut the long sleeve nut in two & machine the mating faces flat. 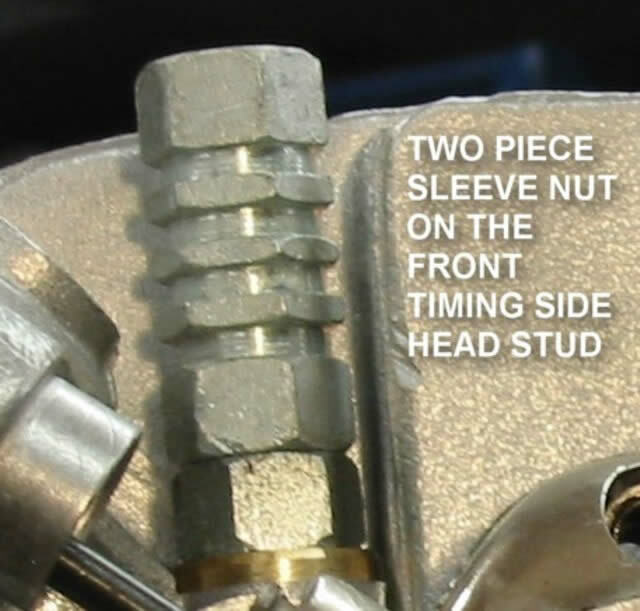 The subsequent shortening of the sleeve nut can be made up by a washer under the head steady. Now on to the next stage of the engine rebuild….